Six years ago former US Department of Transportation Secretary Ray LaHood surprised everyone at the closing reception of the 2010 National Bike Summit when he climbed up on a table and made a short but sweet speech. 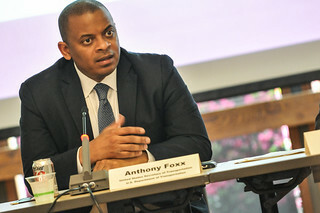 Fast forward to Wednesday when current DOT Secretary Anthony Foxx came to Portland. He struck resonant chords about America’s failure to diversify our transportation system, but as evidenced by the FAST Act that passed under his watch, federal transportation funding and policy shows no signs of ending its long romance with the automobile. So when I got the unexpected opportunity to ask Secretary Foxx a question, the first thing that popped into my head was that indelible image of Ray LaHood standing on a tabletop in that Senate ballroom on Capitol Hill. I wondered if Secretary Foxx had any insights into how we might usher in this era LaHood once spoke of. “I think we’re going to need cars. We’re going to need a mix of transportation options. I think we have a supply-side mentality right now at the federal level where we presume that 80-cents on the dollar should go to the automobile within the Highway Trust Fund. And I actually think over the longer term we’re going to need to look at a more performance-based system where we look at things like: How it congestion best reduced? How do we increase safety? How do we move significant numbers of people most efficiently and effectively and cleanly. And I think that’s going to push us into a different mix of transportation choices. If you’re itching for major changes to the status-quo, this isn’t exactly an earth-shattering answer. But since most people resist real change, maybe Foxx’s measured tone is the best way to bend the arc of transportation toward justice toward people who walk and bike and take transit. As an activist I find that trying to strike the tone that brings about the changes I want without excluding the people I need to bring along to make it happen, is a constant struggle.